Mitochondria (singular mitochondrion) are abundant organelles present in nearly all eukaryotic cells . The main function of mitochondria is to produce adenosine triphosphate (ATP), the cellular energy source. Mitochondria are believed to be the evolutionary result of early anaerobic (nonoxygen-using) eukaryotic cells engulfing aerobic (oxygen-utilizing) bacteria, resulting in a symbiotic relationship between the two organisms. The eukaryotic cells received ATP in exchange for supplying nutrients to the engulfed bacteria, and the bacteria provided ATP and allowed the eukaryotic cell to survive in the increasing oxygen atmosphere present early in Earth's history. The bacterial origin of these organelles is evident in the structure of the mitochondrion, its method of reproduction, and its genetics. Mitochondria are generally oval to elongated in shape, like bacteria, and are approximately 0.5 to 1 micron in diameter. Two membranes like those present in many types of bacteria surround the mitochondrion. Animal mitochondria possess an amazingly simple genetic system. The human mitochondrial genome is a circular deoxyribonucleic acid (DNA) molecule (like a bacterial chromosome ) made up of only 16,569 base pairs of DNA encoding thirty-seven genes. The mitochondrial genome is too small to encode all of the genes necessary for the mitochondrion to function. Instead, most of the genes necessary for mitochondrial functions are contained in the nuclear genome. At some point in evolution, these genes were moved from the mitochondrion to the nucleus and integrated into the nuclear chromosomes. The mechanism by which this transfer occurred is unknown. Mitochondria have their own ribosomes and transfer ribonucleic acid (tRNA) to make mitochondrial-encoded proteins within the mitochondrial matrix (the fluid enclosed by the membrane). The bacterial origins of the ribosome are most evident in the unique sequences of the ribonucleic acid (RNA) and proteins that comprise it. Mitochondrial ribosomes are more like bacterial ribosomes than they are like the cytoplasmic ribosomes made in the nucleus. The mitochondrial machineries that make proteins in the mitochondrial matrix and replicate the mitochondrial DNA are also sensitive to several antibiotics that inhibit bacterial growth. The other cellular systems for protein synthesis and DNA replication in the nucleus are not sensitive to these antibiotics, supporting the notion that the mitochondria have their origin in a bacterial ancestor. Because many of the mitochondrial components are not encoded by the organelle's DNA, but by the nuclear DNA, mitochondria must have mechanisms to take up their components from the surrounding cytoplasm. The mitochondrial proteins encoded by nuclear genes and synthesized on ribosomes in the cytoplasm are transported into the mitochondria by specific machinery found in the mitochondrial membranes. The transport machinery recognizes unique sequences of amino acids found only in mitochondrial proteins. Three-dimensional drawing of the mitochondrion. cell division. Unlike bacteria, however, mitochondria can also fuse with other mitochondria. The mitochondria are unique organelles in that they are surrounded by two membranes, rather than the single membrane that surrounds other non-nuclear organelles in the cell. The outer mitochondrial membrane completely encloses a large internal space called the matrix. The inner mitochondrial membrane is highly folded into structures called cristae, which significantly increase the surface area of the inner membrane. 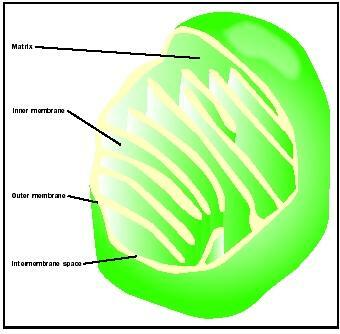 The narrow space between the inner membrane and the outer membranes is known as the intermembrane space. The outer membrane contains a large number of proteins that form pores or channels through the membrane allowing small molecules to pass freely between the intermembrane space and the cytoplasm. These pores make the outer membrane permeable to most ions and small molecules; therefore, the intermembrane space has the same ionic composition as the cytoplasm surrounding the mitochondrion. The inner membrane, on the other hand, is relatively impermeable and blocks the movement of ions and other small molecules. Both the inner and outer mitochondrial membranes contain specific transport proteins that can move large molecules or ions across each by both passive active transport. Only those large molecules that have specific membrane transporters are able to enter mitochondria. This allows the mitochondria to create a unique biochemical environment within the matrix to carry out the energy production reactions. ATP is the main source of energy for most processes in the cell, and large quantities must be made for a cell to function. Most cells use simple sugars, such as glucose , as their primary energy source. The metabolism of glucose begins in the cytoplasm with a process called glycolysis . During glycolysis, glucose is processed from a 6-carbon sugar to two molecules of a 3-carbon compound called pyruvate . However, glycolysis is an inefficient process, yielding only two ATP molecules for each molecule of glucose metabolized. The pyruvate formed in glycolysis can be further metabolized in mitochondria to gain another thirty molecules of ATP from a single original glucose molecule. In addition to the metabolism of pyruvate, fatty acids derived from dietary fat can also be used by mitochondria to make ATP. Krebs Cycle. The metabolic functions of the mitochondrion occur within the matrix and the inner mitochondrial membrane. The matrix contains a highly concentrated mixture of the enzymes of the Krebs, or citric acid, cycle and enzymes for the degradation of fatty acids. Pyruvate and fatty acids from the cytoplasm are actively transported into the mitochondrial matrix by specific membrane transporters that span both the outer and the inner membranes. Inside the matrix, both pyruvate and the fatty acids are first converted to an activated 2-carbon compound called acetyl-Coenzyme A that is the starting point of the Krebs cycle . The enzymes of the Krebs cycle process the acetyl CoA, removing high-energy electrons that will be used as an energy source to produce ATP. The high-energy electrons from the Krebs cycle are stored on the specialized carrier molecules that carry the electrons from the matrix to the inner mitochondrial membrane. Electron Transport Chain. The high-energy electrons from the Krebs cycle are passed to a series of three large protein complexes located in the inner mitochondrial membrane, known as the electron transport chain. Each complex is made up of several proteins organized to form a pathway that moves electrons through the complex. The electrons from the Krebs cycle enter the chain at a very high energy and gradually give up part of their energy as they move through the electron transport chain. The energy from the electrons is used to pump hydrogen ions across the inner mitochondrial membrane from the matrix to the intermembrane space by active transport. This creates a chemical and electrical gradient across the inner membrane, storing energy in much the same way a battery does. Low-energy electrons that emerge from the end of the electron transport chain are combined with an oxygen atom forming one molecule of water for every two electrons that pass through the chain. Because of the similarity to respiration by the body (inhaling oxygen and exhaling carbon dioxide), the Krebs cycle and the electron transport chain together are sometimes referred to as cellular respiration. The CO 2 that humans exhale is a product of the Krebs cycle, and the oxygen humans breathe in is used as the final electron acceptor in the electron transport chain. ATP Synthesis. The electrochemical gradient is harnessed to produce ATP by an enzyme in the inner membrane called ATP synthase. As the hydrogen ions flow back down their concentration gradient into the matrix through the ATP synthase complex, the energy released is used to add a phosphate group to adenosine diphosphate ( ADP ) to make adenosine triphosphate. Because the actions of the electron transport chain and ATPase are tightly linked, the combination of the two is referred to as oxidative phosphorylation. In fact, some types of mitochondria uncouple the movement of electrons through the electron transport chain from ATP syntheses by shuttling electrons back across the inner membrane. Since the energy is not used to make ATP it can be released as heat energy. Such mitochondria are found in "brown fat" in babies and hibernating animals, and are an important source of heat. Within a cell, mitochondria are typically positioned near areas of high ATP use such as near the contractile apparatus of muscle cells or wrapped around the whiplike tail of the sperm. The positioning of mitochondria within a cell is at least partially due to attachment to the microtubule cytoskeleton . The cytoskeleton is a very dynamic scaffold within the cytoplasm, constantly growing and retracting. As it grows and retracts, it drags along attached organelles such as mitochondria. Destruction of the microtubules with specific drugs leads to a disorganized arrangement of the mitochondria that is restored when the cytoskeleton is allowed to reform. Mitochondrial genes are not inherited by the same mechanism as nuclear genes. At fertilization of an egg by a sperm, the egg nucleus and sperm nucleus each contribute equally to the genetic makeup of the zygote nucleus. However, all of the mitochondria, and therefore all the mitochondrial genes, are contributed to the zygote by the egg. At fertilization of an egg, a single sperm enters the egg along with the mitochondria that it uses to provide the energy needed for its swimming behavior. However, the mitochondria provided by the sperm are targeted for destruction very soon after entry into the egg. The egg itself contains relatively few mitochondria, but it is these mitochondria that survive and divide to populate the cells of the adult organism. This type of inheritance is called maternal inheritance and is common to the mitochondria of all animals. Because mitochondria are inherited from the mother only, the sequence of mitochondrial DNA is sometimes used to trace the lineage of families. Defects in mitochondrial genes are responsible for numerous maternally inherited diseases, including a number of muscle diseases (myopathies). The maternal inheritance of mitochondria is being used to trace human evolutionary groups back to their African origins.